Why (you should decorate with) White? 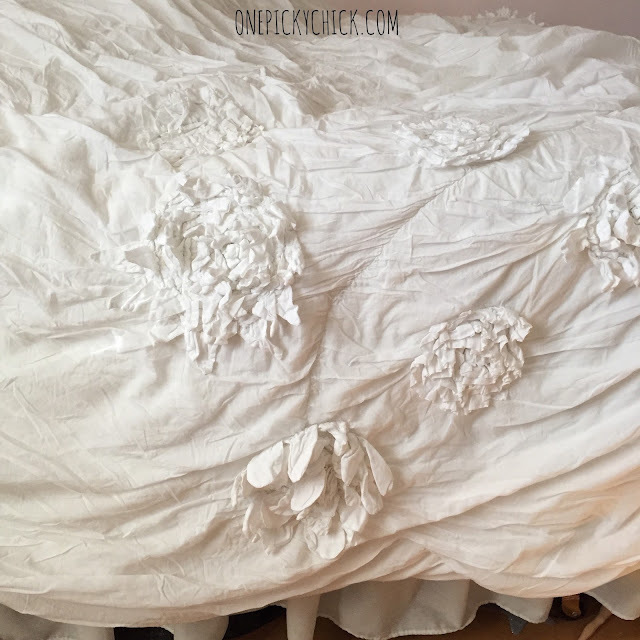 I decorate a lot with white. When you come to my house one thing is clear: I like WHITE. I use the "color" quite a bit. In fact, it dominates my house. 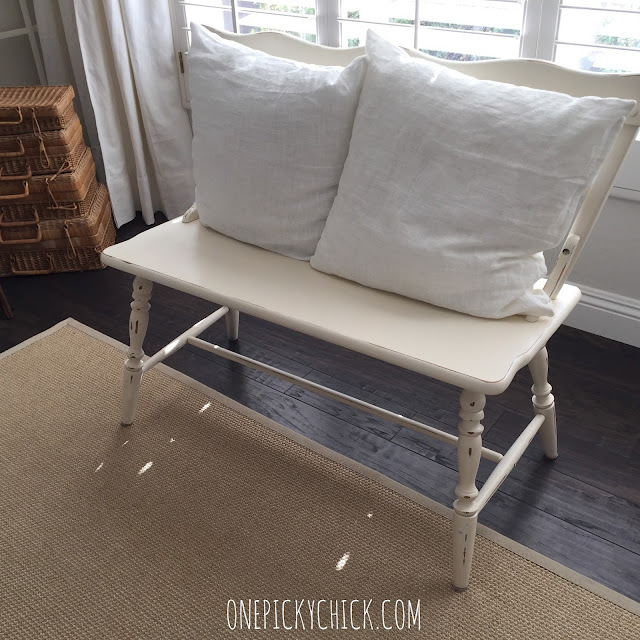 While some may say white is boring, I challenge that... there is plenty of visual appeal to the shade. This is theeee most important reason to go white. There is nothing it can't do. The possibilities are endless. 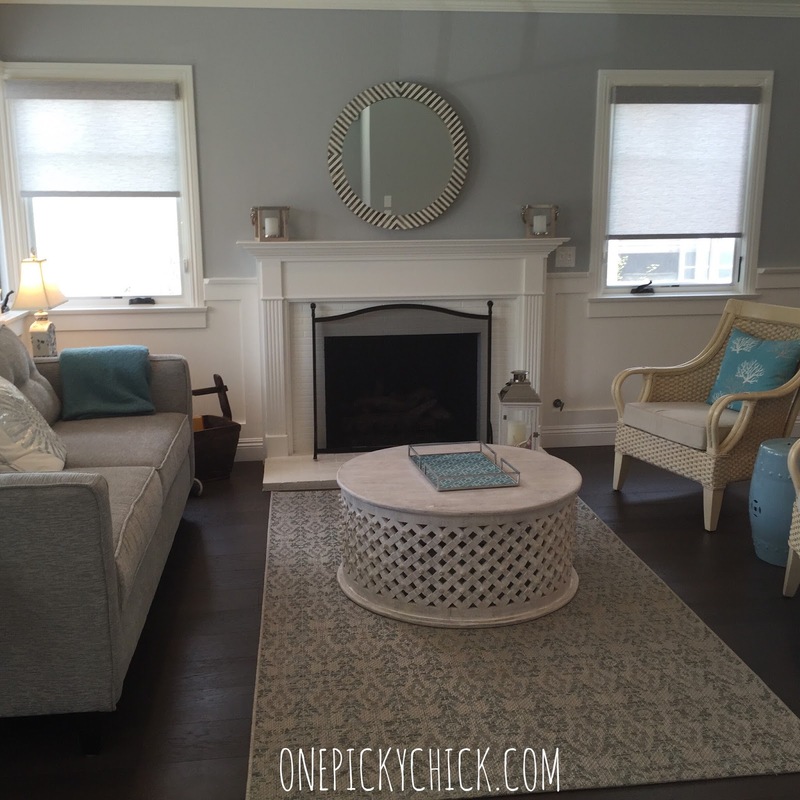 You can change it up any time you want, even bring in other accent colors and pieces. For instance, I can "Bring Spring In" in to a white living room like THIS (check out that previous post) or I can do Summer like THIS (another previous post) in the same WHITE living room. Change a couple pillows, decorative accent colors and BAM - whole new look/whole new room. Use the white plates for every holiday because they can look like any holiday. Throw in some orange and brown for Thanksgiving or pink and red for Valentines. 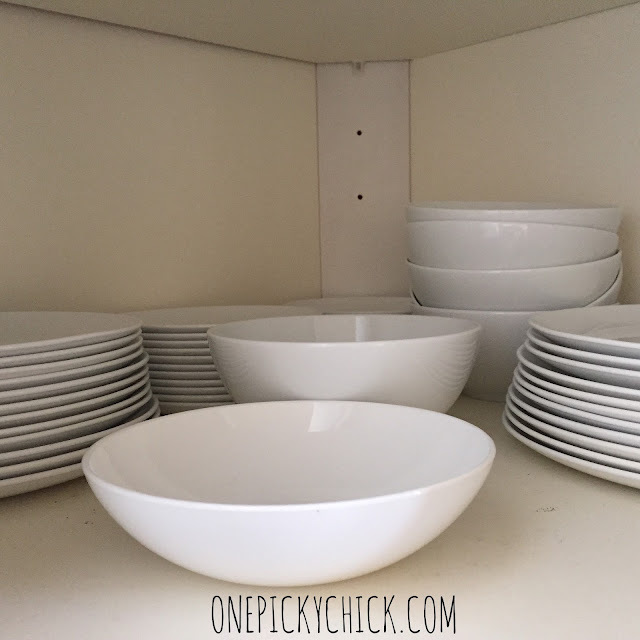 On the other hand, colored plates sit and gather dust in the cupboard because they can only be used for certain occasions. They're extremely limiting. This is especially important if you live in a small house. White opens up any room. I often refer to decorating like putting together a good outfit... so keeping with that: think about it, if you've gained weight - which is the last color you put on? Uh huh.... white makes you look BIGGER! so painted walls white. House looks GIANORMOUS! White will and should always stay white. If you use bleach. It's gorgeous and should stay "new" looking for a a long time... since I can use bleach (somewhat sparingly - don't go too crazy - it's harsh on materials). Also towels. 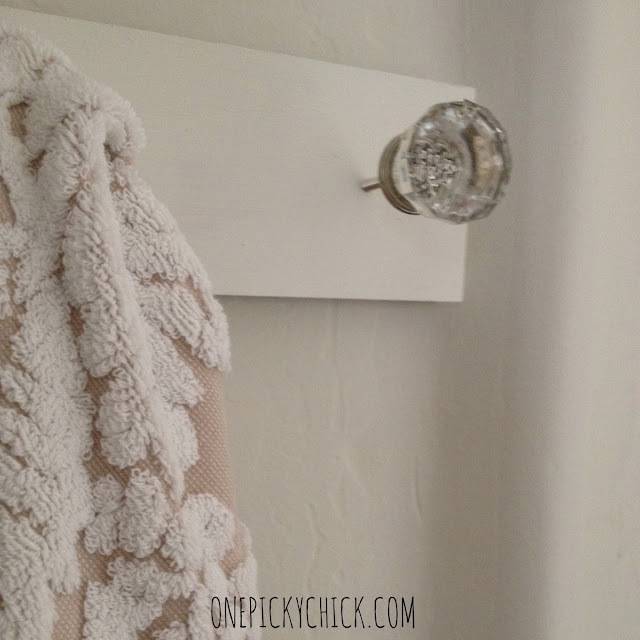 Yes, we made the white towel holder below. It's just wood with glass door knobs sticking out! 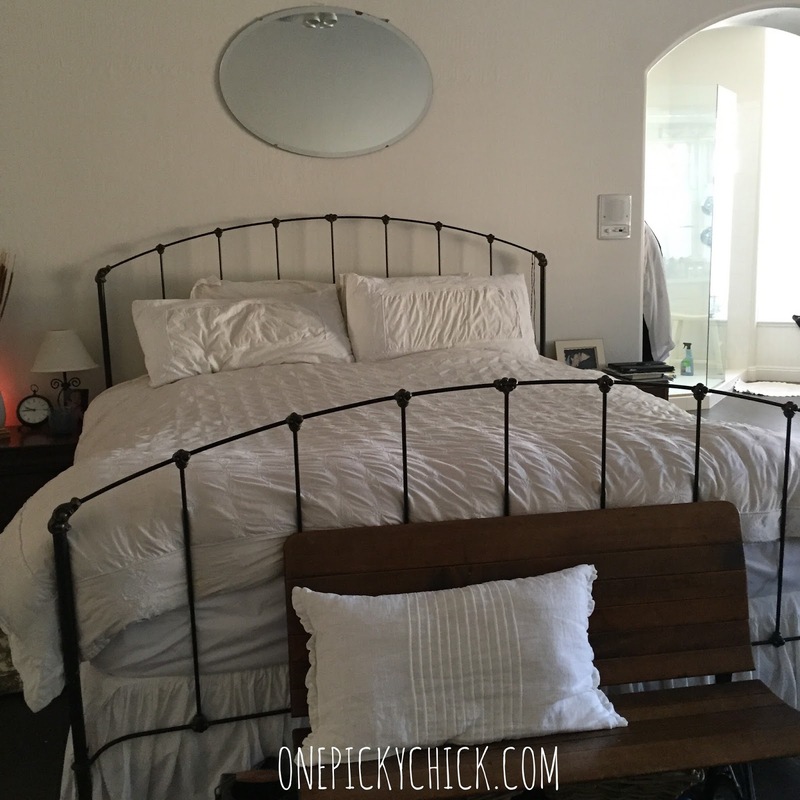 You may not have a budget to hire a decorator so become your own. If you pick white to work with... your job gets a lot easier. 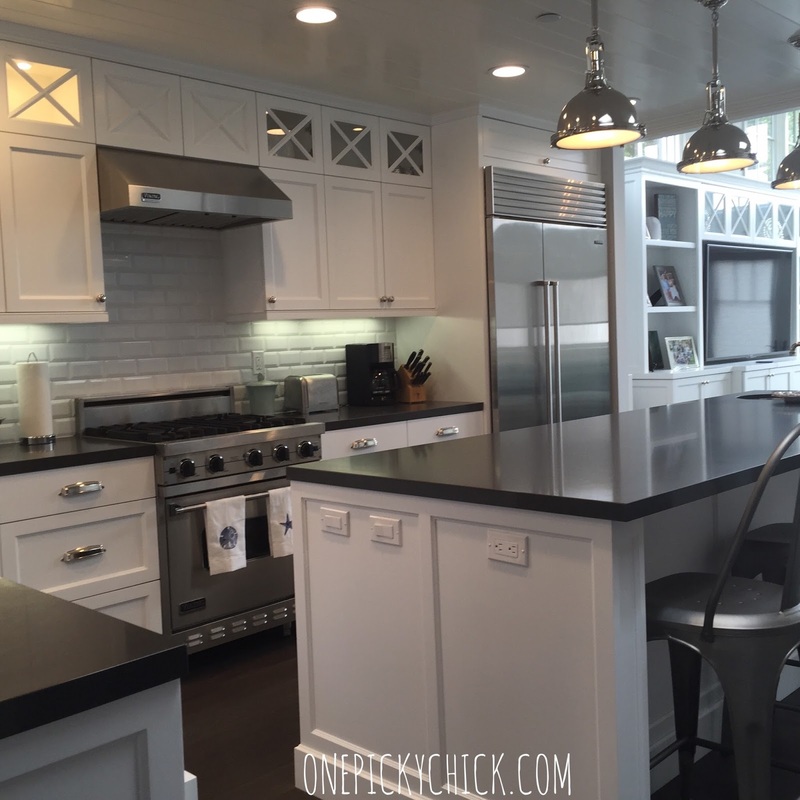 Color can be hard to manage but white isn't. Sure, there are many different shades of white, which can be daunting, but the good news is they (typically) all work together. In this picture you see a bright white on that side table and a more creamy white on the coffee table and bench in the back ground. Then the upholstery is almost an almond white. But they all look good against each other. 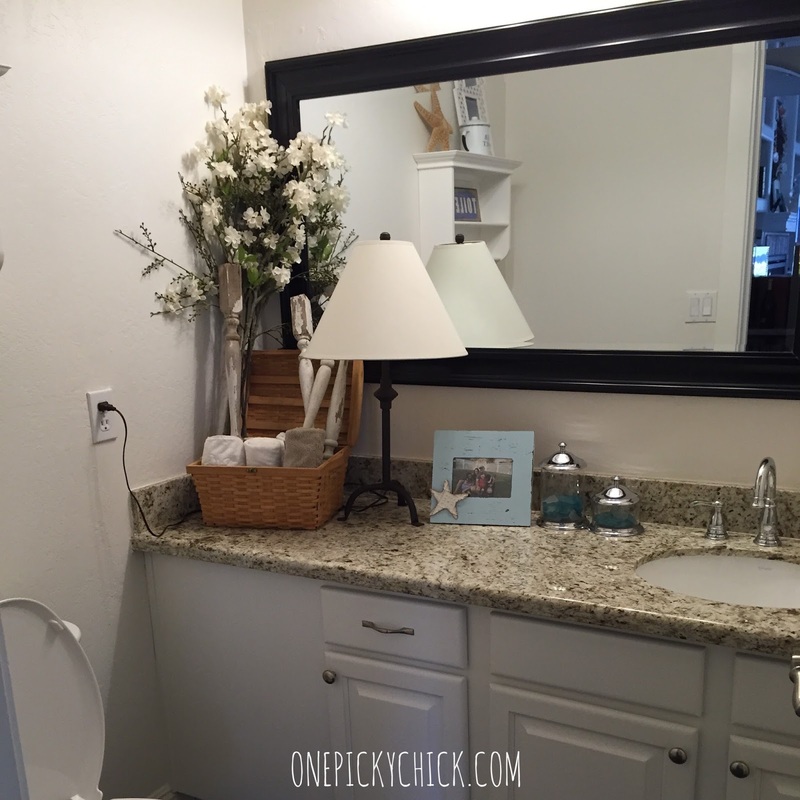 cabinets are one white, paint on walls are another, the lamp shade's a serious cream, then the towels and decorative pieces... call it 50 shades of WHITE! White will never go out of style. 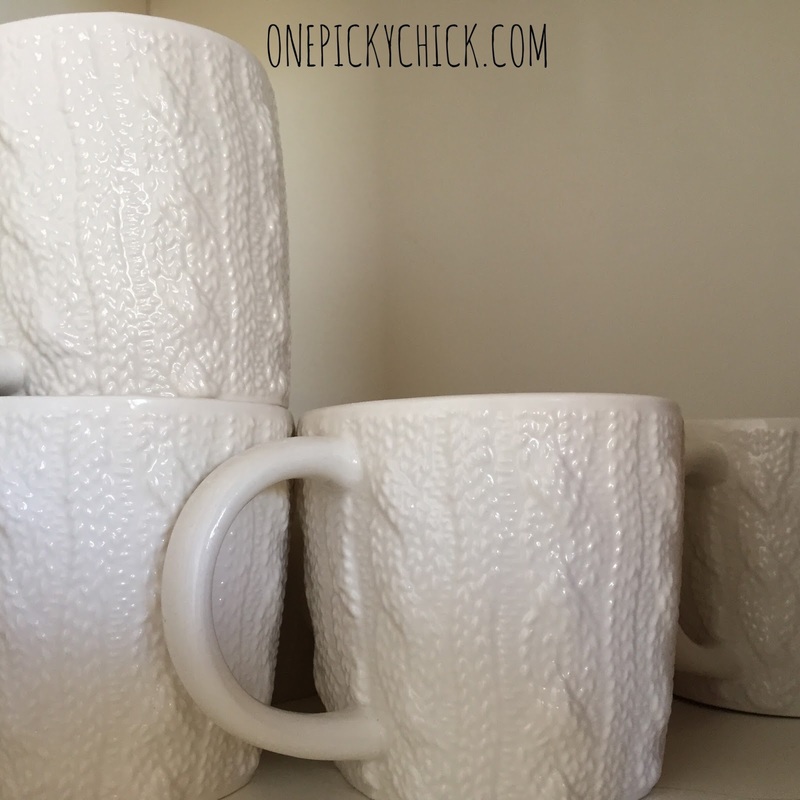 Colors go in out out, they can be really trendy, but white is forever. That's probably why brides dress in that color! It stands the test of time! You may never have to paint your house again. But that orange room... yea, that's going to be painted over sooner than later! White is not a passing trend. 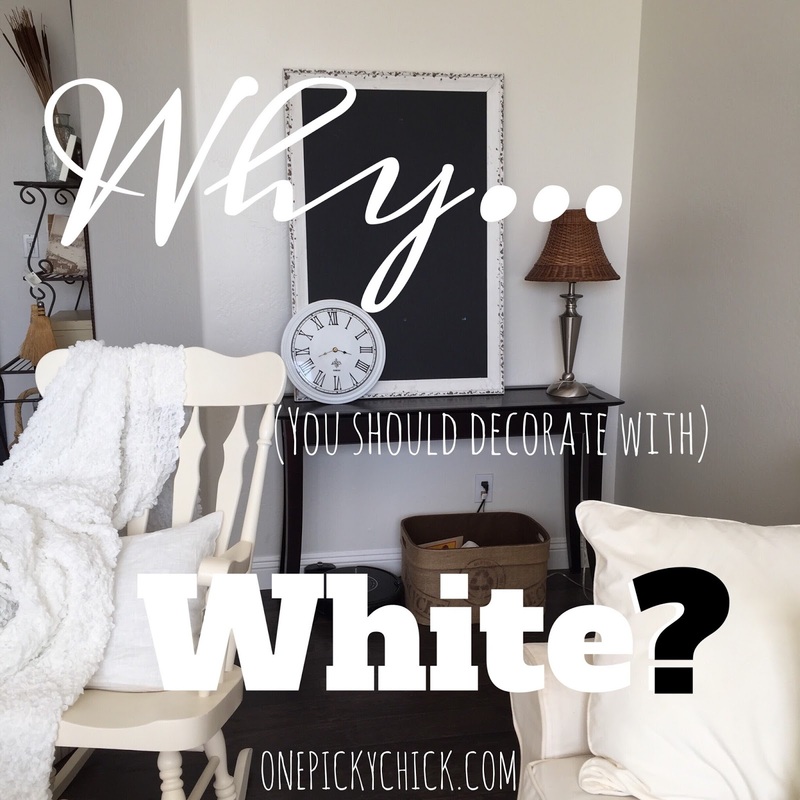 That my friends is Why You Should Decorate with White... all other colors pale in comparison. 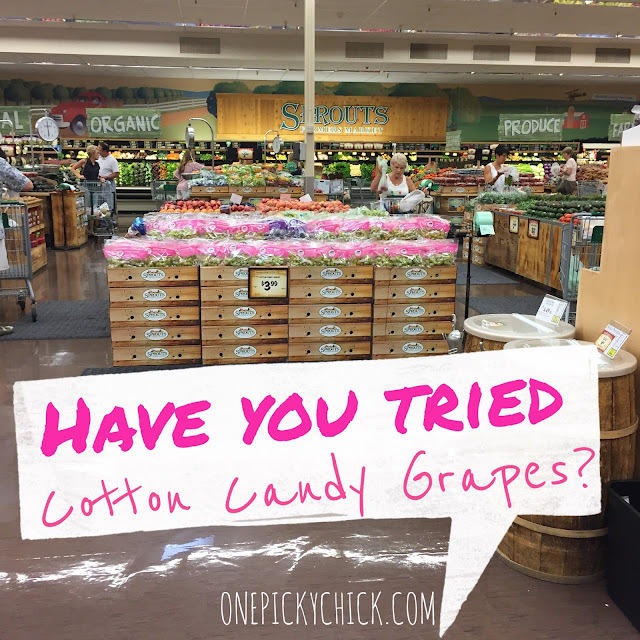 Heard of Cotton Candy Grapes? You have to try this fruit. They honestly taste like cotton candy. I know it seems so weird... really weird. I heard about these grapes from a friend a few years ago and tried them for the first time then... I was BLOWN AWAY! And I'm, you know... picky! 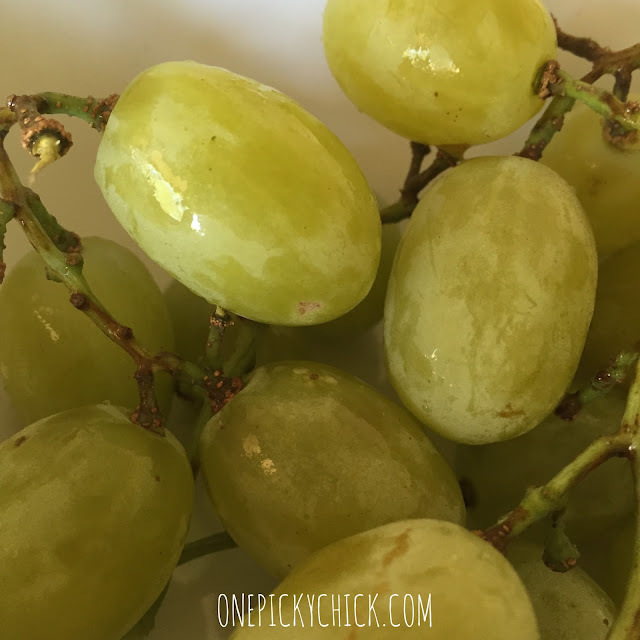 Looking at them... they appear to be just ordinary, regular green grapes. See? But bite into one and the taste is very different. They honestly remind you of the old fashioned, air blown, sugary, pink, pillowy looking cotton candy! As the story goes, the grape grower out of California apparently "engineered" them to be that way. He cross bred them to make it happen. But they're sustainably grown, so says the package, non-GMO. They come out one time a year, for about a month or more. The time available obviously varies dependent upon the crop and year. 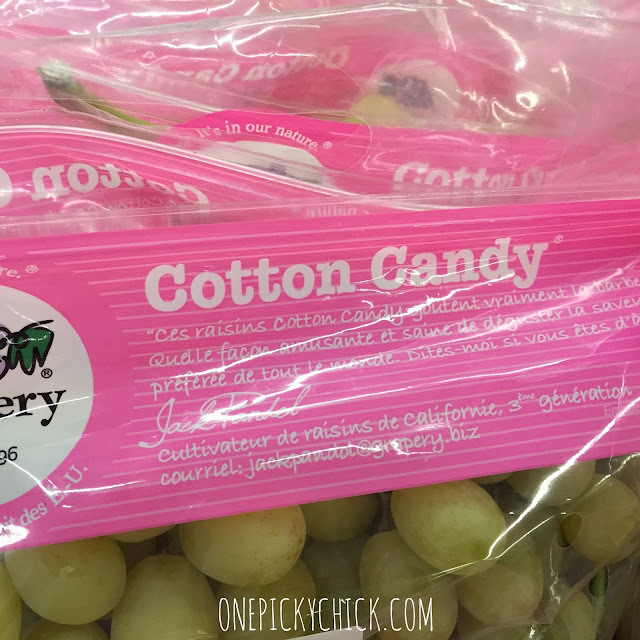 I also feel there are some years you can taste more "cotton-candy" than others. But the bottom line, they really do have the taste you can't miss. The bonus: no extra sugar and food coloring like the real stuff! I found mine here at Sprouts. But, in Arizona, they're also at at AJ's, Haggens and Sam's Club. If you live in another state go to this website HERE to see where they sell them near you! They're not cheap... the bunch I got ran me a whopping $7.70 (they're $3.99 a lb.) but they're worth it. 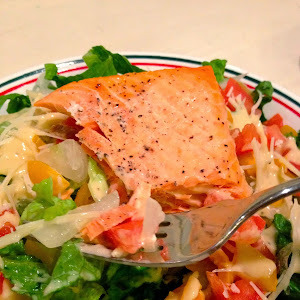 Consider it a special Summer treat! But most of all... enjoy! 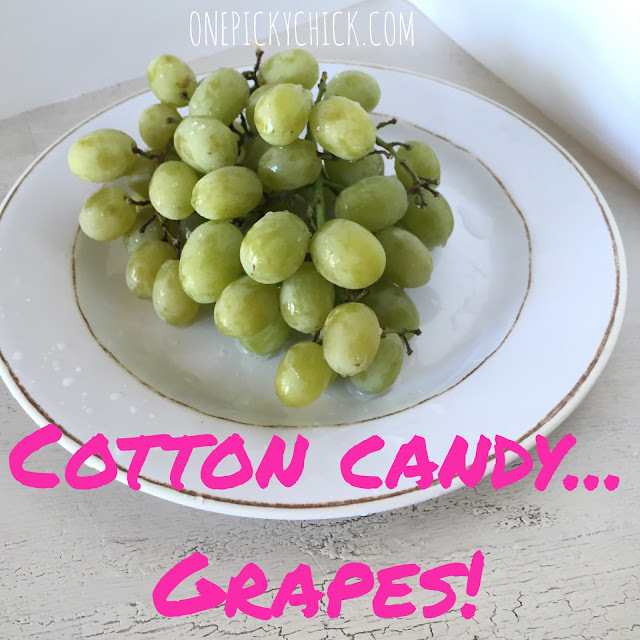 I give the Cotton Candy Grapes to 3 little guys for the first time! Click here to watch their reactions. This is live to "tape" people so be kind! 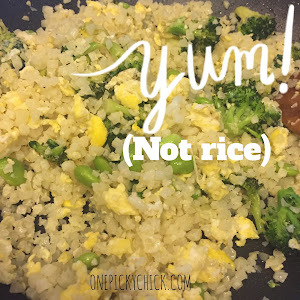 And if you receive this post through an email just go to ONEPICKYCHICK.COM to see it there! Many of us have one. Ever since I was young... my Mom had a gift "closet". She would buy things when she saw them on sale - for a good price. 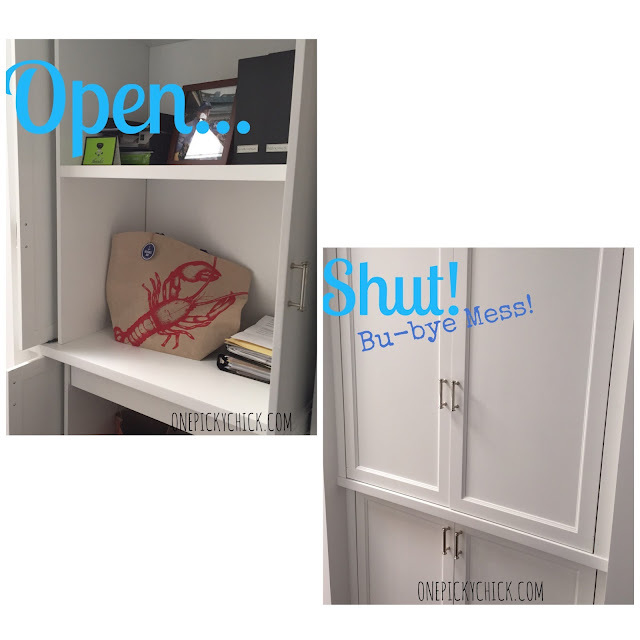 Because in life, especially with kids... things pop up, right? I have always thought this was a good idea. I have one now. Many people do. Even Oprah! So that's why when I was having dinner with a friend a few weeks back and she told me this story... my jaw dropped to the floor! Get ready - it's a doozy. Got popcorn? Let me start at the beginning: my friend got a birthday party invite for her 2 girls. But the invitation was given less than 2 days before the actual event. My friend is a busy, working Mom currently going through a divorce. There's little to no time to run out and buy a gift at the last minute. So she reached into her gift closet and pulled out 3 things. A Kids Pedicure set, a very recently bought 3-in-1 lotion from Ulta and a wallet. I think that was it. Anyways, the kids went to the party and the next week at school... everything but the wallet was RETURNED! Yep you heard me right - RETURNED to the girls. "Yes a couple of the gifts were returned but the blue wallet was a keeper. Thank you for contacting me about this ------ felt sad and bummed about it. I packaged it up for return. Out of sight, out of mind. I think ----- would be happy to receive a replacement gift. I think it would bring a smile to her face." When my friend read a COUPLE gifts were returned she asked her girls who said, "yea she gave us back everything but the wallet because she didn't like the stuff!" Well, that was a little disgusting. Who GIVES BACK a GIFT to the person WHO GAVE IT TO YOU because you don't LIKE IT!???? Ahhhhhh... lame people. So she decided to write the woman back again. "Your explanation isn't logical or needed. It was a kids birthday. With all your years of motherhood I would expect you to be able to shop for a kids gift. How unfortunate. Also, speaking and involving kids in a matter you dislike is a very interesting parenting method. I will continue to keep children out of this matter. Everyone is entitled to their opinions, so thank you for voicing yours. I hope you have a great day." Wow! What is this world coming to? The bottom line for me is exactly what my friend said: when you get a gift you graciously accept it because the reason you invited those friends to your party was for their company. NOT the gift you expected to receive. 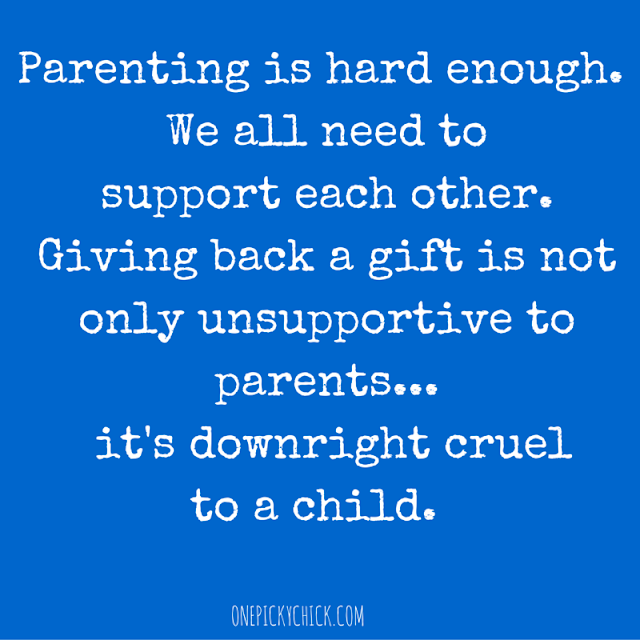 Returning gifts - to the giver - is just not an option. End of story. As far as my friend involving her children... SHE HAD NO CHOICE. 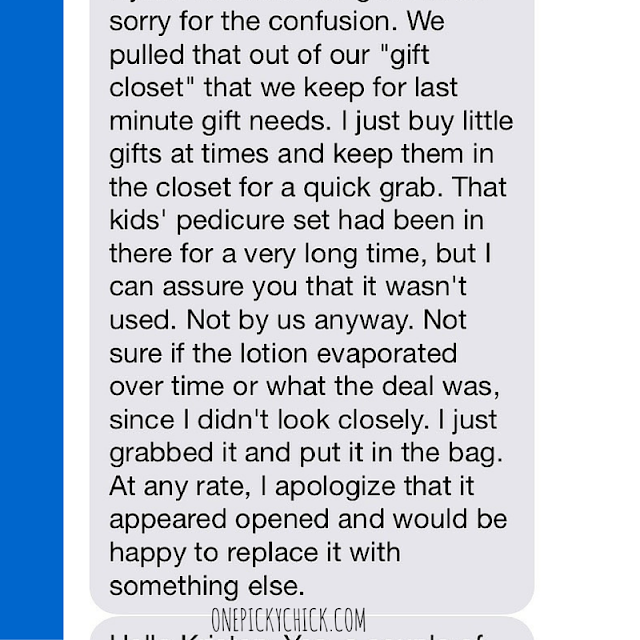 The other woman is the one who went down that road in the first place by letting her child give back the gifts. I agree with involving them from there on out because the door was opened. They are forced to walk through it... and hopefully learn a life lesson along the way. 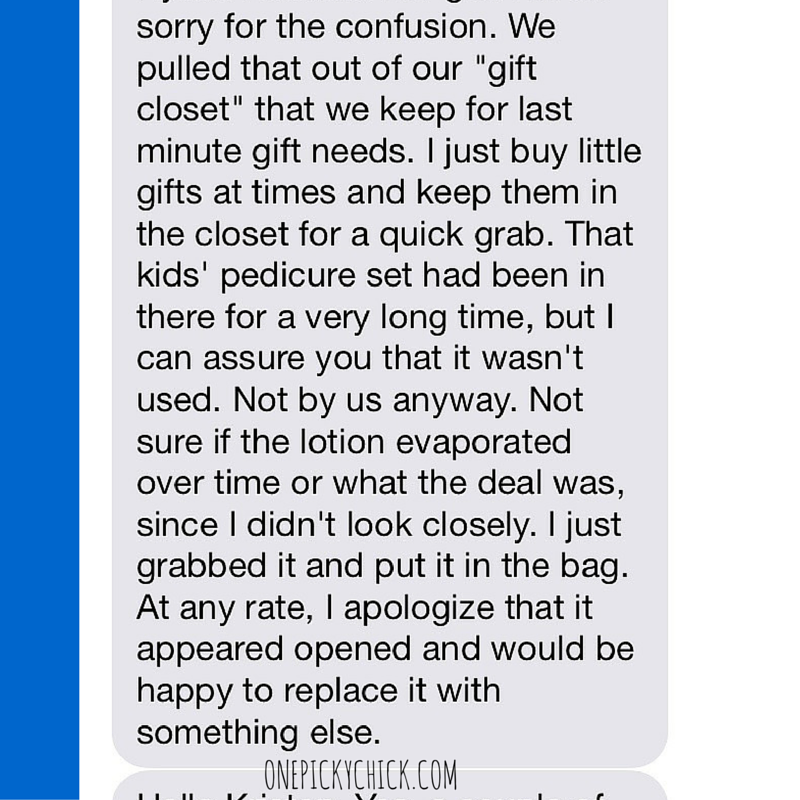 For the record, as I stated above, I too have a gift closet. 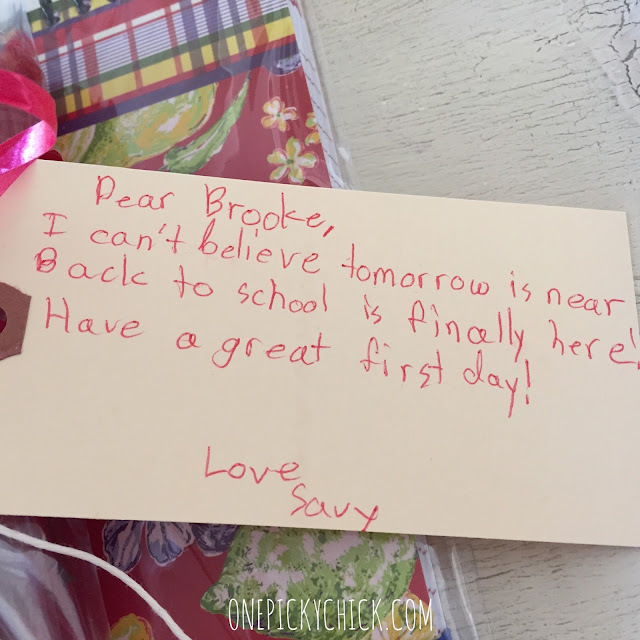 I try not to stash too much in it because I know kids are fickle and sometimes want to return items they receive (to actual stores that is) so I often like to include gift receipts if I can. 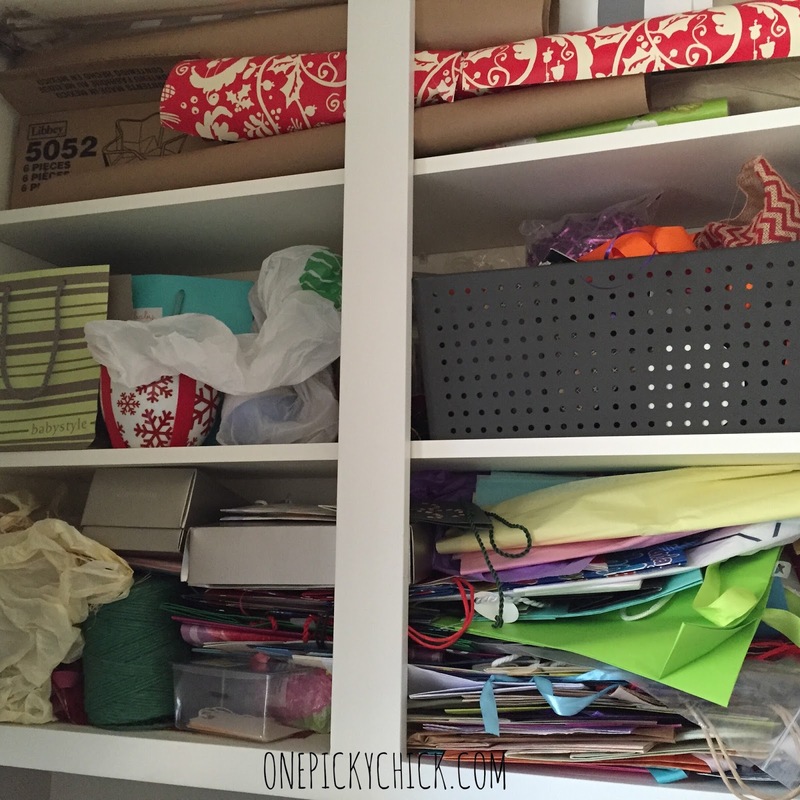 But there are times and occasions (like this one) that a gift closet is very necessary and incredibly helpful! Look guys, parenting is hard enough - we all need to support each other - giving back a gift is not only un-supportive to parents but it's downright cruel to a child. Imagine being the 3rd grader who had to accept the returned gift at school? That could have been devastating for a little girl. All because the birthday girl didn't like her gift... sigh. In the end, I just couldn't get over the nerve of this woman! I just couldn't get over the whole thing. It makes me sad, angry, confused, frustrated and worried so I had to write about it. Now, what do you all think? Tell me. 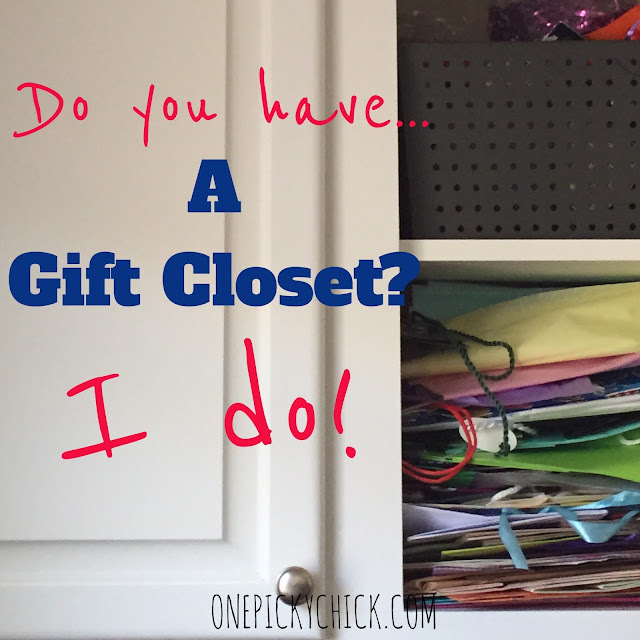 Plus, I'd like to know: do you have gift closet? **Here's my 2nd Periscope ever. My new thought is I'll do a "live hit" on each topic I cover. See how it works. At one point maybe more than 5 people will watch it! 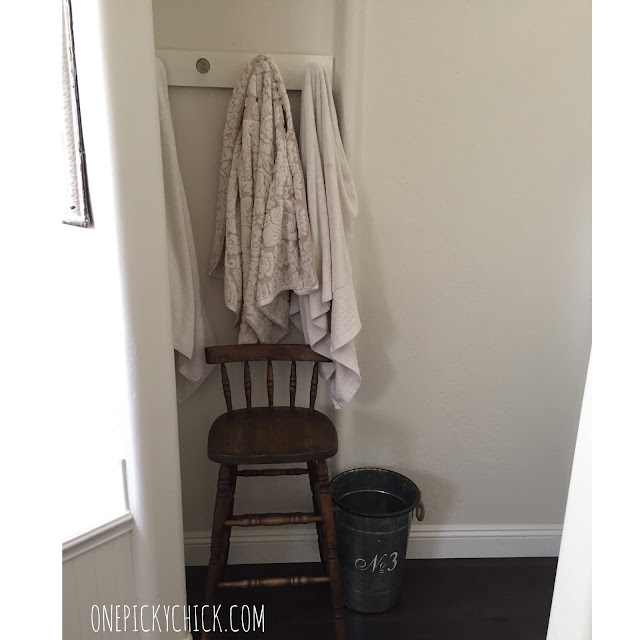 If you get the email posts & can't see it then just go to the actual blog at ONEPICKYCHICK.COM it will be attached there too. 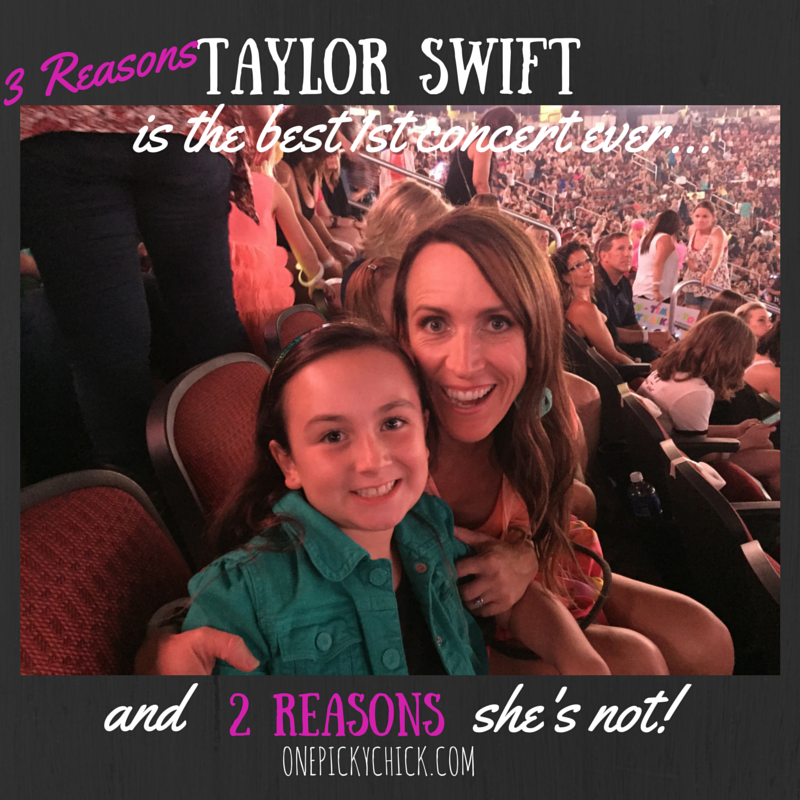 3 Reasons Taylor Swift is the Perfect "First Concert" choice & 2 Reasons She's Not! 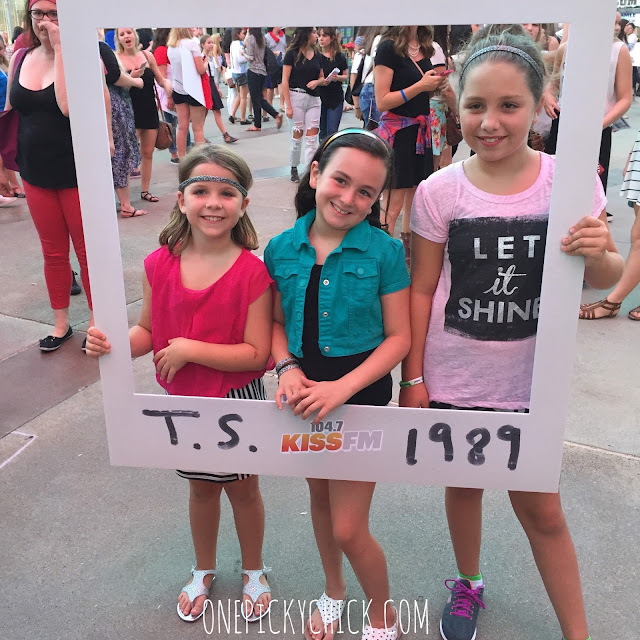 My daughter went to her first concert. My daughter is 8... almost 9. She had never been to a concert. Until now. We heard a while back that Taylor Swift was coming to Arizona. Both my husband and I thought it would be such a treat to have our daughter go see her... but alas, we never got tickets. A couple days ago that changed and someone wanted to know if we'd like to buy some. So my wheels started turning. She had dance that night so I decided to surprise her in the middle of classes. I yanked her out and her daddy told her on the phone where she was going. Then she quickly changed (the night before I asked her what she would wear to a movie premiere if she went to one) and we met up with some friends and headed over the the arena. Nice plan but it kind of back fired. She was super confused about where she was going... I think she may be a planner like me. But once she got into it... the girl had fun! She just does... it ooooozes from her. There are no bad words coming from her mouth, no overt sexual madness, nothing that Moms want to cover their children's eyes from. Her show is simply good, clean (goofy) dancing fun! Sadly, that's really hard to find these days. But here's the deal: our society is better off with some T-Swift types. Swift seems very aware of her position as a celebrity and the responsibility that goes with it. It's a big one. I dare to say most young stars squander it... yet she seems to revel in it. She's assumed a high, important, anomaly of a position that is usually used and abused this day in age. I'm thankful it is NOT lost on her... a good role model, she is. Her Music is Really Fabulous (even for parents). The last song she performed at her 1989 concert is probably my favorite... I just can't Shake "Shake it Off"... but there's about 10 or more other songs that are close, meeting and exceeding that caliber. And this being said from a non-music reviewer. She also played a special, touching song written by her and co-written by a Phoenix Mom who lost her son to cancer several years ago. 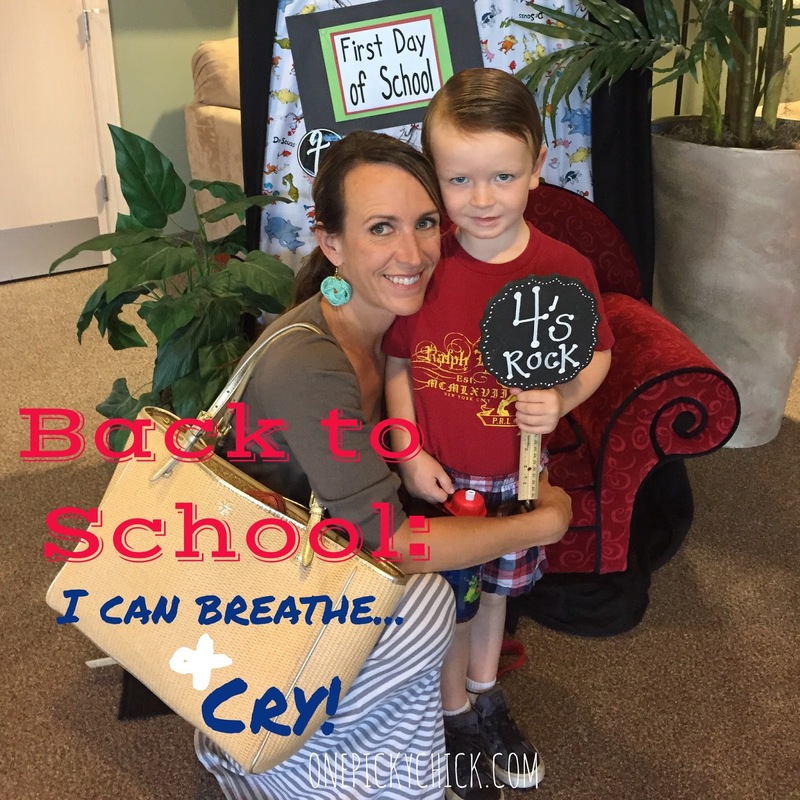 The woman started a blog, called RockStarRonan, as she was going through the devastatingly, slow march to her son's eventual death. The mother, Maya, was painfully and brutally honest in her words and it caught the attention of many, including Swift, who first performed the song on a Cancer Television Special a few years ago and vowed never to do it again... until last night. Maya, her family and her recent addition, Poppy, were in the audience. There are a lot of trials and tribulations that go on in a young person's life. Break ups, break downs, losses, gains, wins, failures, friends, enemies, heart aches, home work, the list goes on and on and on and on... throughout her show Swift talks about them. 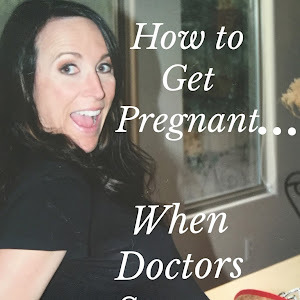 She talks about positive girl friendships, relationships versus "situation-ships," being who you are and nobody but... and a funny thing happens when you head out the door: you leave feeling just a little more empowered to take on the world the next day. And who can't use some extra positive juice in their soul? No matter what your age? The Music is Really Loud. I know, it's a concert. Music has to be loud. But for a little girls ears it's really hard to handle. I should have brought some ear plugs. My bad. She really didn't want to take this picture... it was AFTER the show! Bottom line: Taylor Swift is a phenomenal performer and dare I say: person. All I could think of, being in the stage of life that I am right now is simply: Man, her parents must be proud of her. I grew up wanting to make my parents proud of me. I'm pretty sure she did too. She succeeded. She's got this celebrity thing down in a way not many others do... so that makes her special and different than any others. If you ask me, that should be celebrated as much the music she makes. For us, her concert was a memory that will last forever. I'm glad we did it (even though I need coffee right now)! 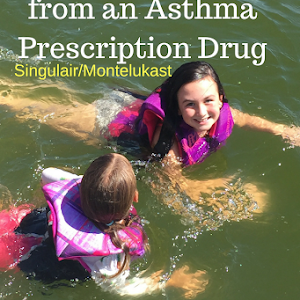 Because in some way, I know my little girl's a better person because of it... and maybe... so am I. 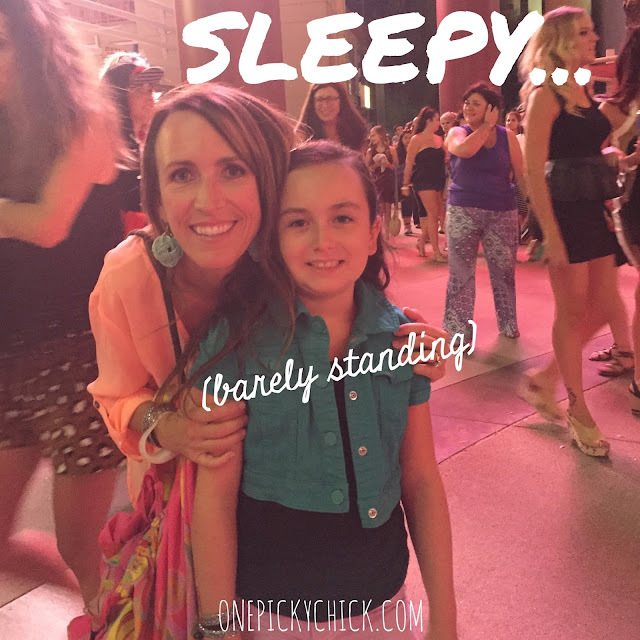 ***Want to see my 1st Periscope attempt on this blog topic? Periscope is the LIVE video feed sweeping the world! Be kind. It was a bit of rough first go! Back-to School Surprise Gift Idea! 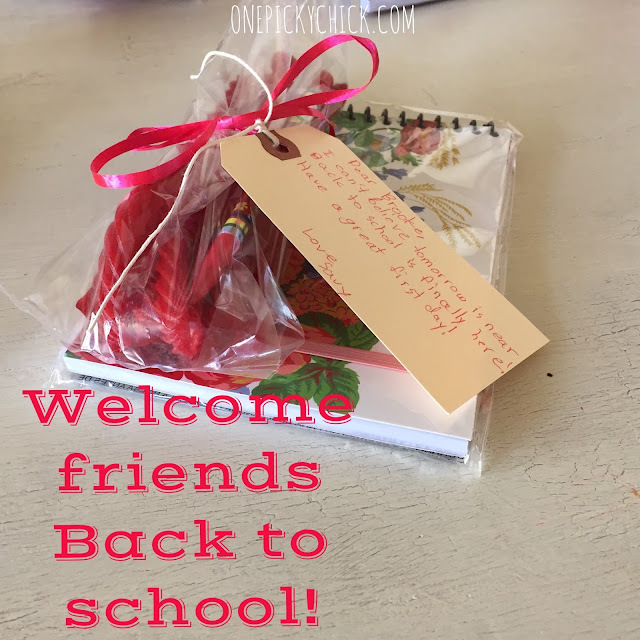 Here's a fun way to Welcome friends Back-to School! Plus, get the creative juices flowin'! This idea is more for the older kids. 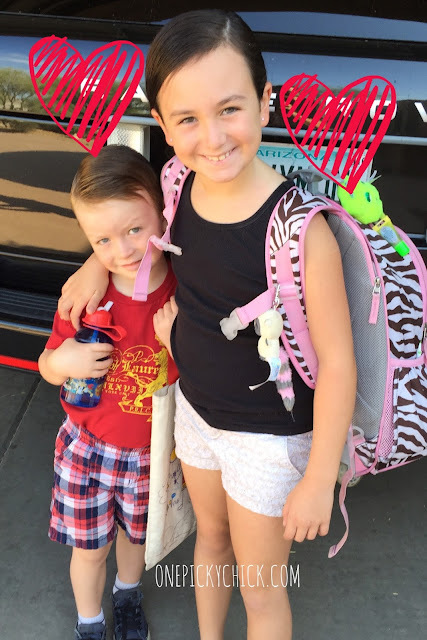 Not my pre-schooler but his sister, who's almost 9 and now in the 4th grade. 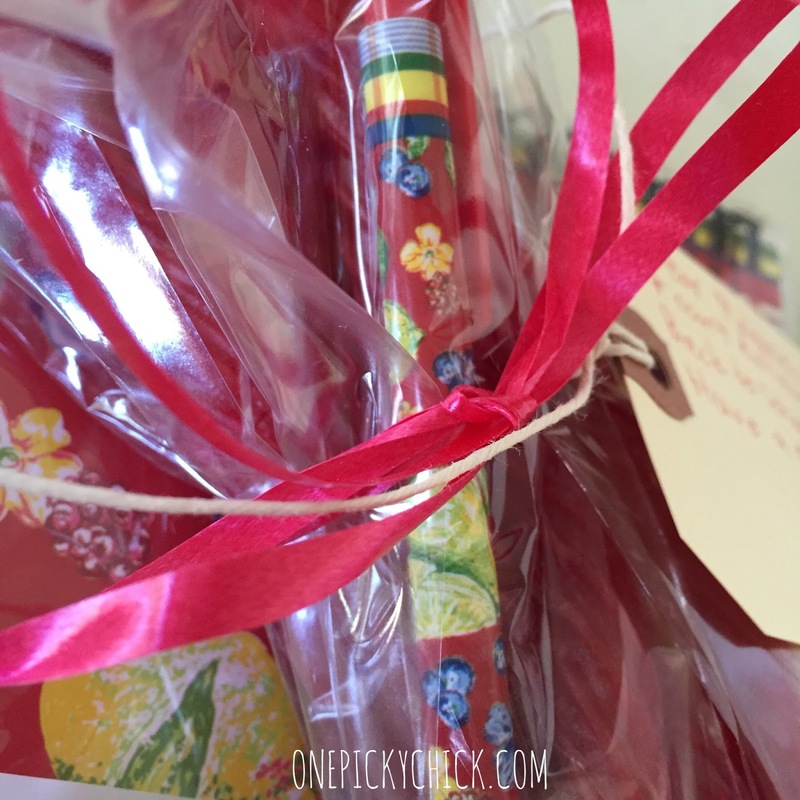 We simply made up little gift packs with red licorice, a pretty mechanical pencil and a notepad. Back to school is finally here! The night before school started, we drove to her friends houses, rang the door bell and left it at the front door step. Plus, I texted the Moms to give them a head's up too. It was great fun as we kind of felt like we were on a special mission or something! My thought now is to kind of make this a tradition (if I can keep up with it)... maybe we'll continue doing it for a few of her friends each year. The ideas will grow with the kids age and maybe I'll put her totally in charge of it to test her creativity. Here's the deal: the years will pass quickly but the memories will stay forever. 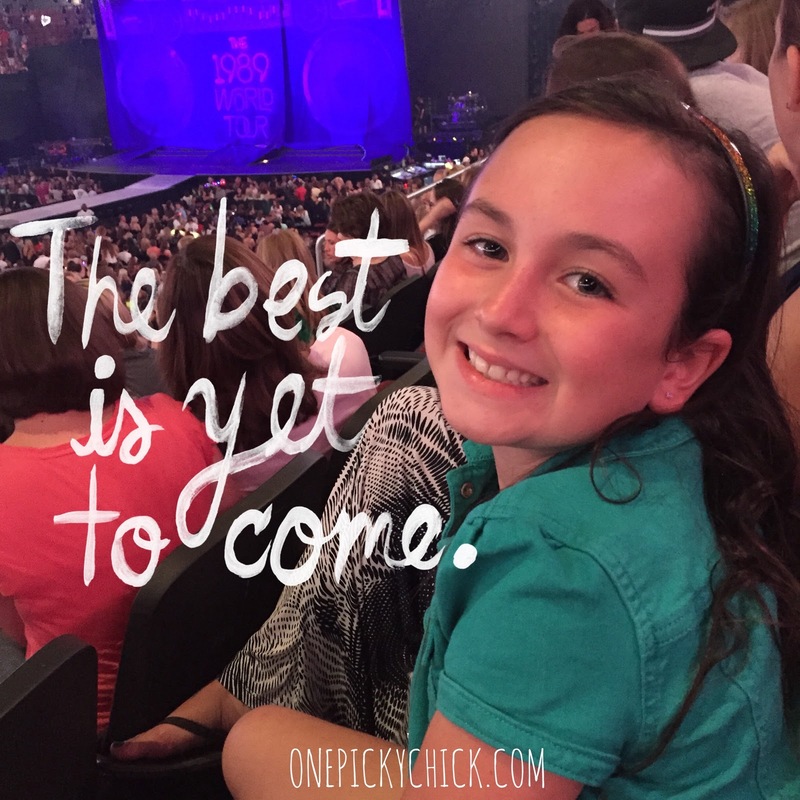 I'm planning on giving my children more good memories than bad to look back on as they grow. Maybe this... is one of them! My kids are back in school. So why are there tears in my eyes? It was a long, glorious Summer. We had so much fun. We traveled. Got wet. Ate too much. Slept too late. We laughed. There was sand. Family. Lots of friends. Road-trips, boat rides. Shopping and walking and crying. There was lots of arguing and some yelling too. But we loved (almost) every minute of it. The time has come to go back to school and start the routine again. The morning rush and night time run. Deadlines and dancing. Games and homework. Packed lunches and pick ups. I can't wait. Mama can get some things done. I can bake or write without interruption, run errands and browse through stores. I have some time, if only a few hours, each week. I will breath deep, then actually hear the sound of the air when I exhale. Right, I can even go to yoga! So, why then do I feel like as I take that deep breath of fresh air... a tear will simultaneously run down my cheek? I would guess it's simply because Summer Break 2015 is behind us and we will never get it back again. My son is going into his last year of pre-school, my daughter 4th grade and this part of our life story forever closes, not be re-opened. And that's so final. I made it through the first day of both of my kid's school this week. Not one tear... I would guess that's because of the hustle and bustle of the early morning slam. But, on the pre-school orientation night that came days before I could not contain myself. It was my last experience (ever) as a parent of a pre-schooler. And it was on this recent night when I saw his first teacher ever (2's class) and she gave "that smile." You know, the one that simultaneously makes you think about where you're going and where you came from? I couldn't help but lose it. I cried in front of many mothers I didn't know and I felt helpless to my own emotions. I got it together quickly but as I sit here I am leaking tears again. Just the thought of it... the thought of them growing up too fast and wanting to do it all over does not escape me. Right now it consumes me. Yes, I know... there are many more starts to school years and end of Summers to come... but never this one. This one is over. But I will, as all of us will, continue to look forward as I turn to look back, giving the very same smile to other mothers along the way. The one that makes us think about where we're going and where we came from all at the same time. Here are 5 things you need to know. 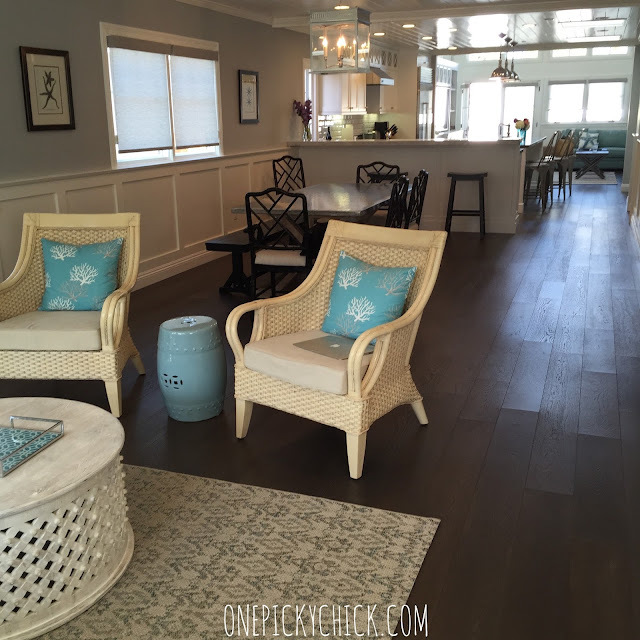 Plus, just check out this gorge beach house! I love homes. I love to look at them, decorate them, dream about them! 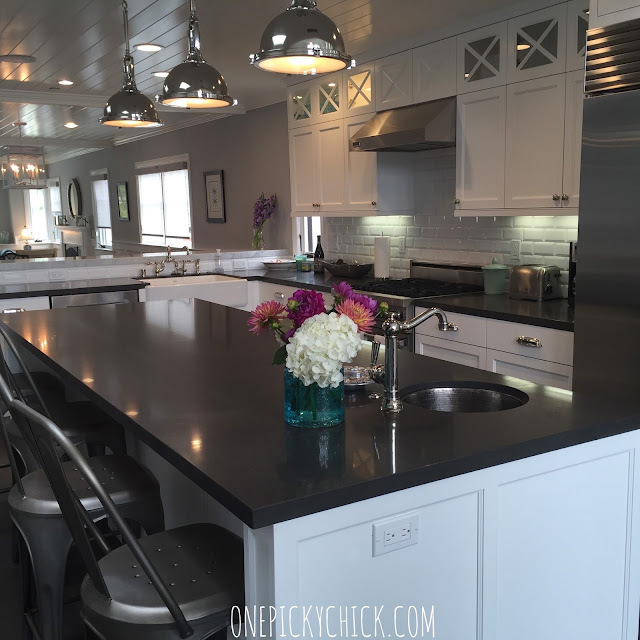 My friend recently completely re-did her house top to bottom all in one sweep. A complete home re-build. Unlike me. I'm doing a total remodel piece-by-peice. 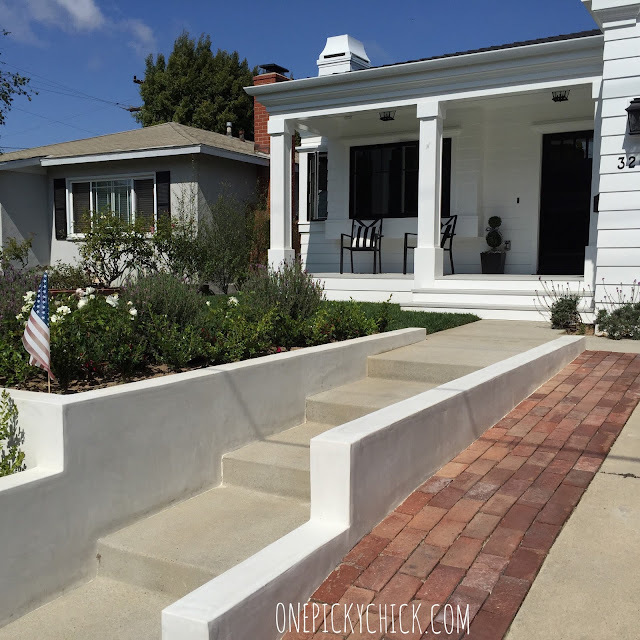 She knocked down walls, changed floor plans and enlarged the house all in one sweep. It meant the family and to move out of the house for over 6 months. A HUGE undertaking. But for her, much like it is for me, a fun one. The reason? Her family just needed more space. 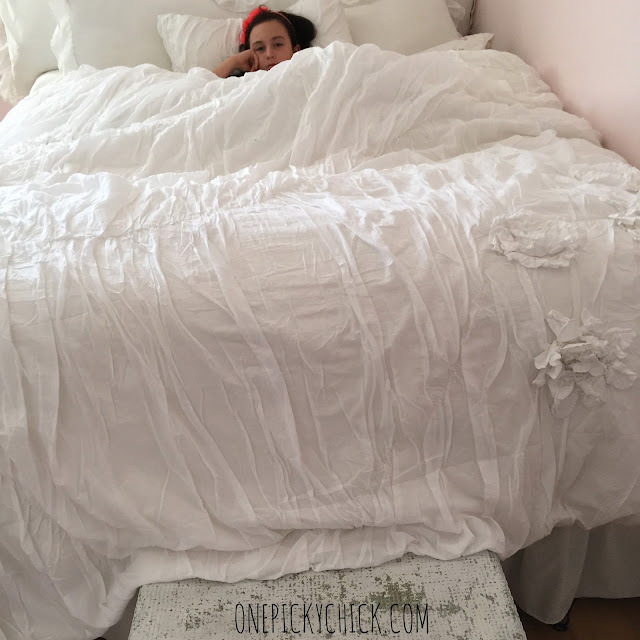 She felt as if they were always on top of each other inside their house. There was almost no where to go (under 1400 feet) for 4 people, it was snug! 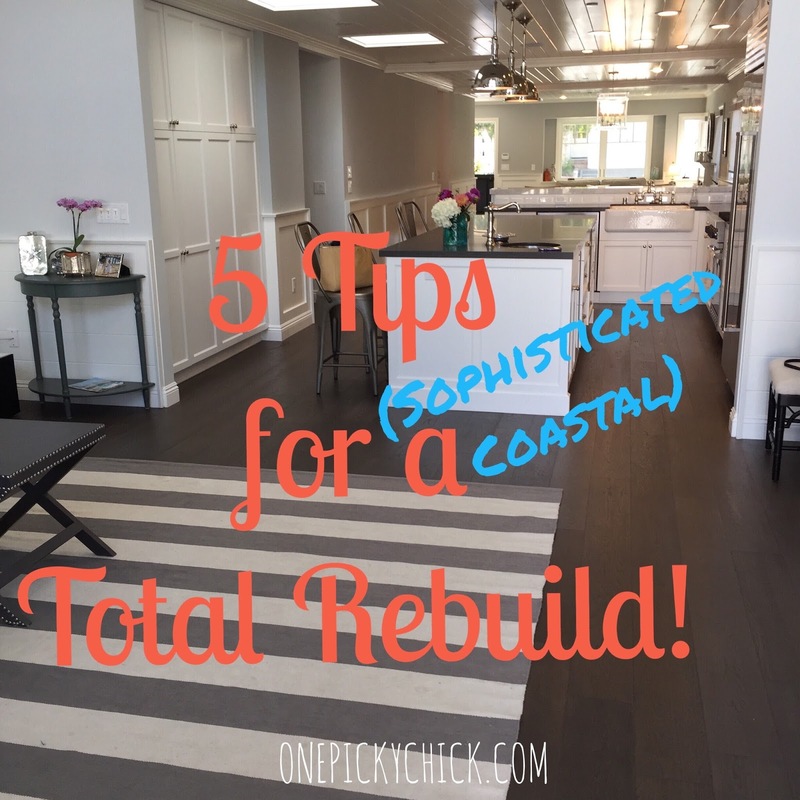 So we came up with 5 tips for a Total Home Rebuild! This is true when starting any project. It's kind of like DEFINING YOUR STYLE - something I talked about when I first started this blog... you can read more about that HERE. But the bottom line is know what you want before you start. Scour magazines, the internet, Pinterest, visit other houses, you need to do your research if you want to get this right. what she likes to call: Sophisticated Coastal. It's much more refined, upscale and, frankly, grown up. 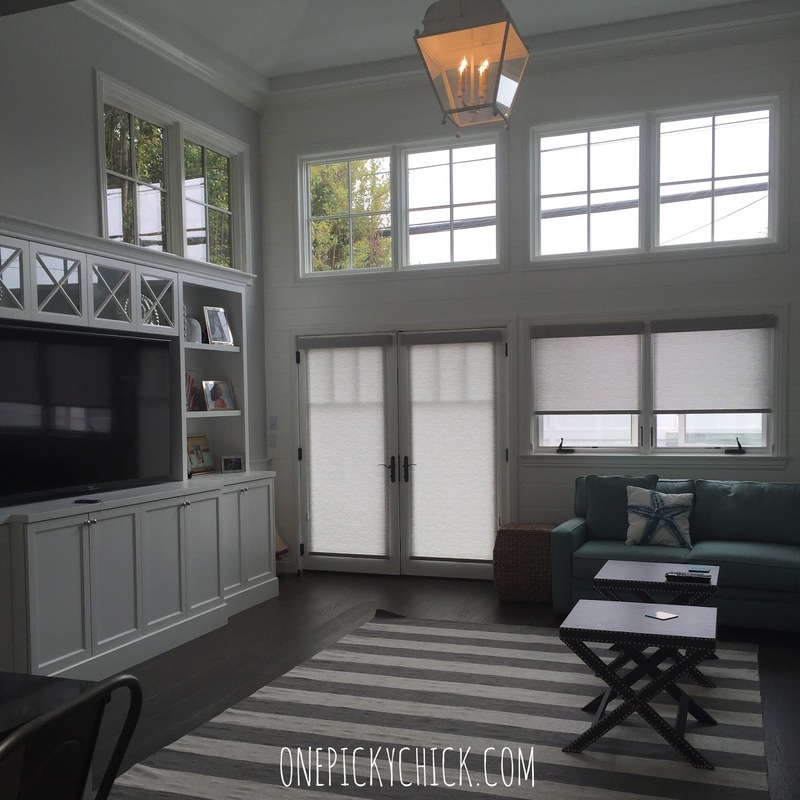 The black and white is very popular right now among the west coast beach communities - but still has a classic and traditional vibe. 2 - Add as much detail to your Architectural Plan. For big projects like this you're going to need to get an Architect to work for you. My friend did and she regrets only one thing: that they didn't do more detailed work with him. There was lots of "we'll just add that later..." but that skewed the cost a lot. All of those add ins, well, add up! She suggests putting everything in there, i.e. 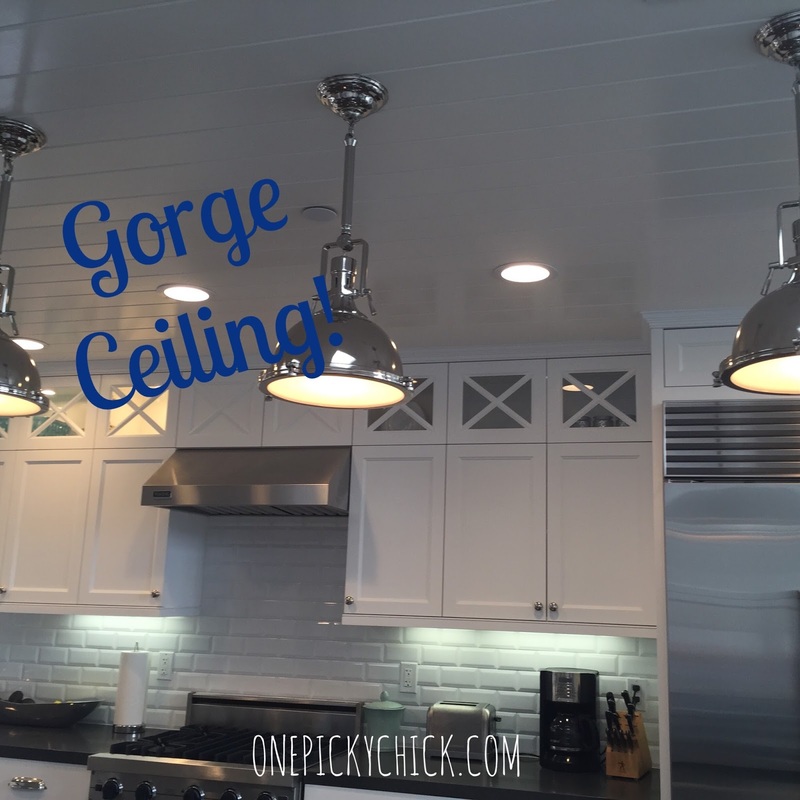 : built ins, light fixtures, fans, moldings. Put them ALL in the plan and you'll get a better representation of cost. It's her biggest regret because it really messed up their budget! 2A - Don't wait - it won't get done! On that note, if you want to do something... anything... do it NOW. She says there are some things they thought: "we can do that a few months after we move in" that will never happen. 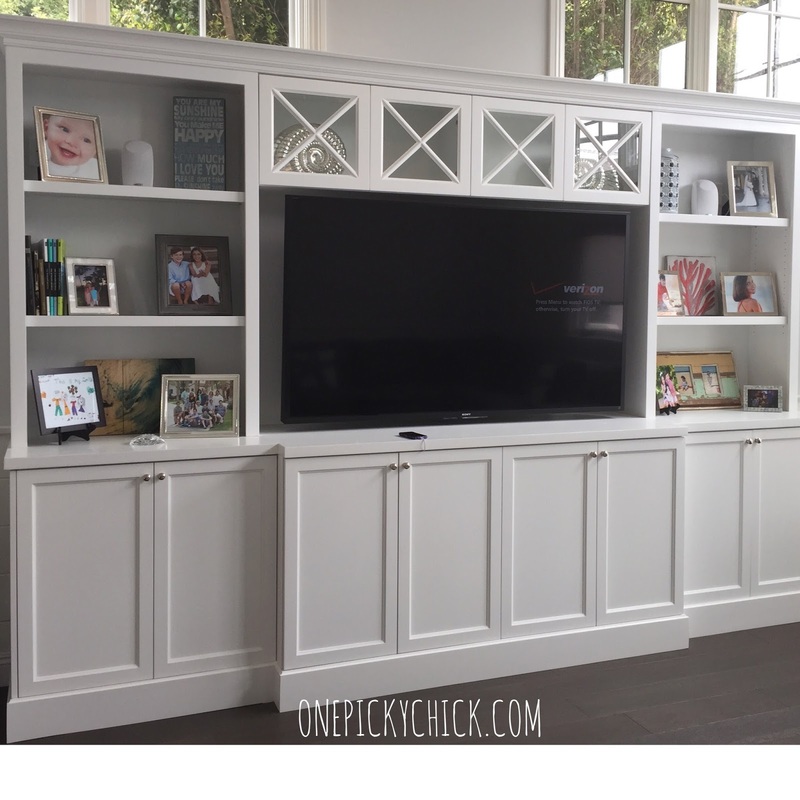 For instance, this paneling/molding in her tv/family room is beautiful! She considered doing it elsewhere... maybe in her daughter's room. She now says that will NEVER happen. SO if there's anything important to you, like Nike used to say: just DO it. This is important. Typically this person is the one who has more of the vision and really WANTS the job because it's lots of work. They have to learn to make timely decisions and give answers on the fly... sometimes without consulting the other person so as not to slow down the construction process. The spouse has to trust the PM will do the right things. So pick wisely! This is unfortunate but true. Not everything will turn out exactly how you want it. Not everything can be done the way in which you dream it. There are limitations. Often those have to do with the pocketbook, other times it has to do with city ordinances and rules. You will compromise at some point during this... once, several or multiple times... and that's just the way it is! 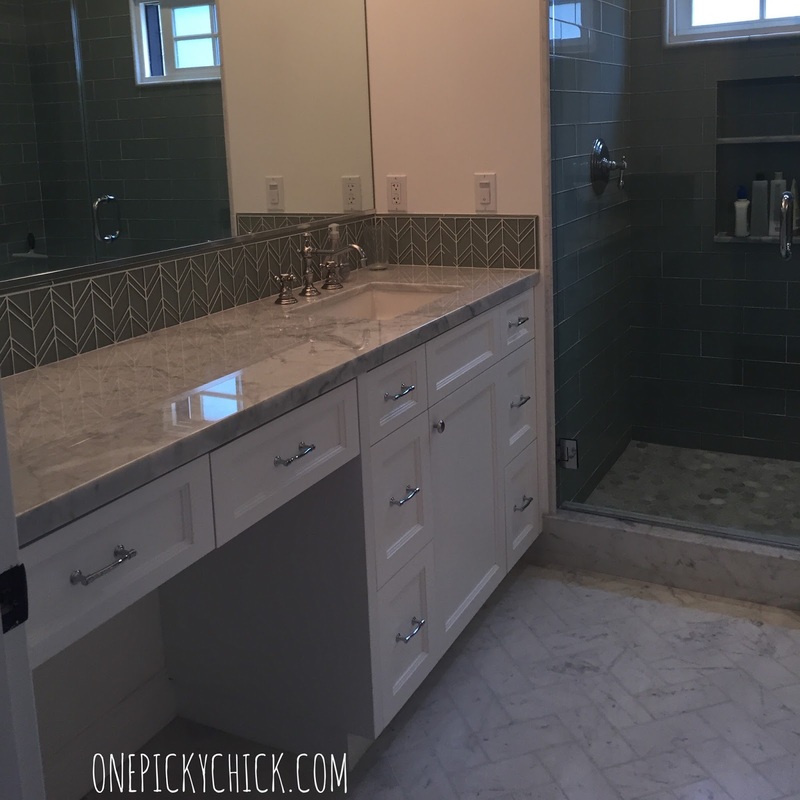 The floor in her bathroom, as you can see in a herringbone pattern, is a gorgeous marble tile and everyone loves it. 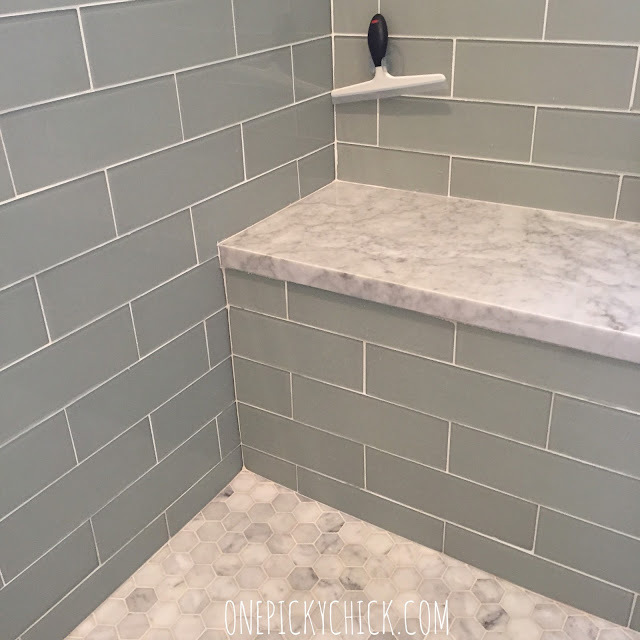 It kind of reflects the color of her sea foam green tiles from the shower walls which continues the coastal vibe... but guess what? She wanted another tile. It was $95 a square foot so it didn't happen... this one did, at $15 a square foot! It's called compromise. Live it and love it! 5 - Start shopping now! Lastly, and this is the most fun one... most likely if you're doing a complete re-build you will need to shop a bit. There's no time like the present to start this task... lots and lots of on line shopping. Also, don't be afraid to bargain shop (or knock-off shop). 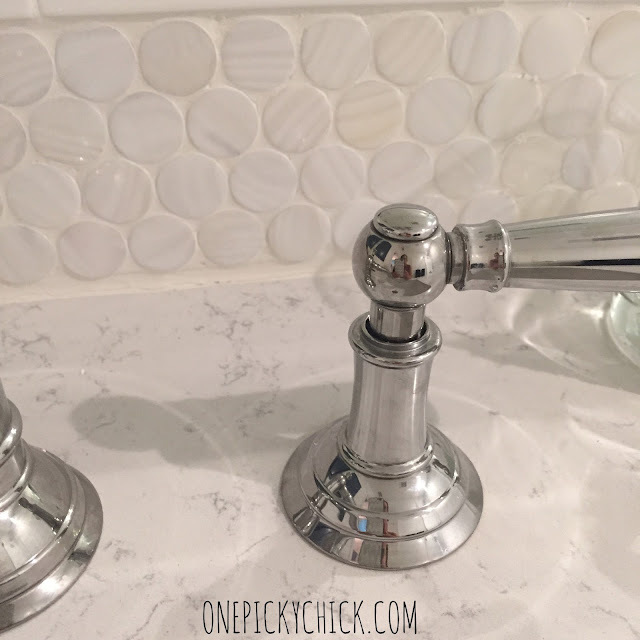 She says you can google the piece that you want by name and then add "knock off" to it, sometimes, if it's popular enough it may just have a chance of being made a little cheaper in pure "knock off" style! And if it's a central piece in a busy living room area (and you have KIDS) a cheaper version of ANYTHING is a good way to go! For instance, she found the chairs to the right (below) at a chain retail store for a great price... they're not the exact color she wants so she's thinking of painting them. Same story with the aqua colored sectional you barely see in the right side of the picture (below). Now that the tips are out there... let's finish the tour of this amazing "Sophisticated-Coastal" (with touches of industrial-chic) Home! The built in with the extra-large TV is one thing her husband said he MUST have. And let's be honest... what man DOESN'T dream about having a 9,000 inch flat screen???? But she loves the look of everything that surrounds that flat screen and so do I! Next up, the kitchen. She opted for a gray Quartz (brand Caesarstone, color Raven) countertop. 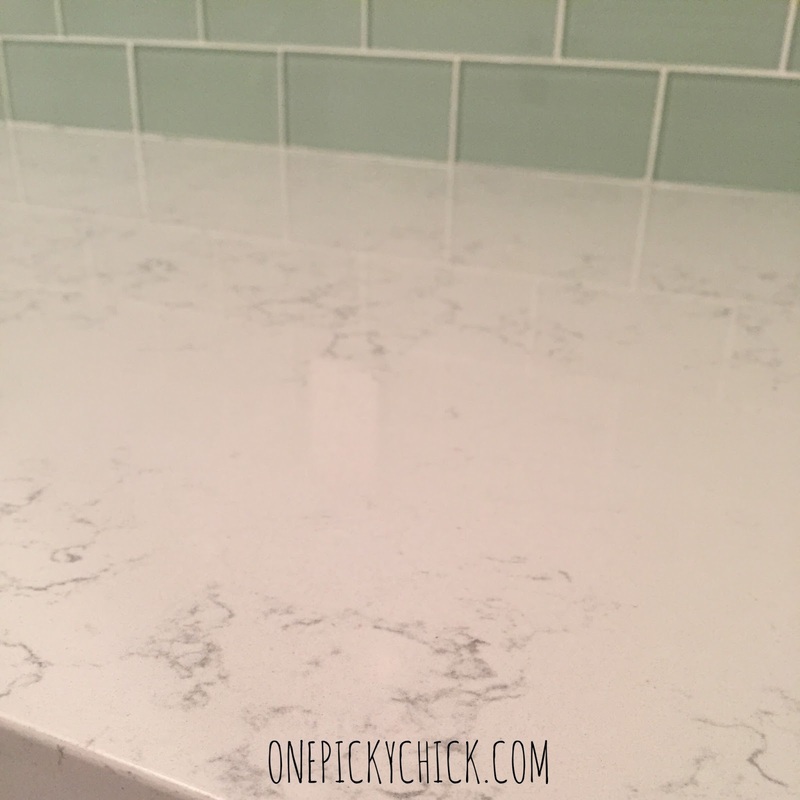 She says it's more of a matte finish than the ever popular (but continually fading) granite so it shows smudges more. But she doesn't care - still loves the look! 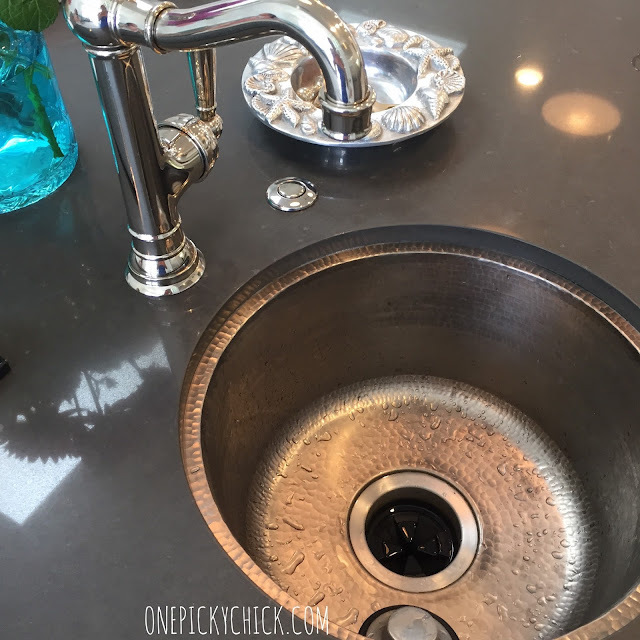 Other highlights include a small sink in her island... with a hammered finished that looks stunning. and you can't miss the paneled celling. LOVE! 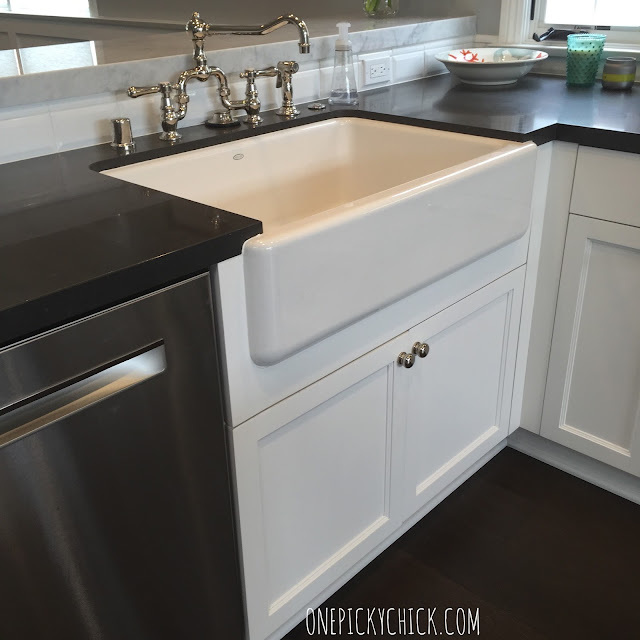 She also opted for a farmhouse kitchen sink... and above it you can see her "bar" area is a marble. That, she says, is very hard to keep clean since it's so porous but the contrast is classic and beautiful. 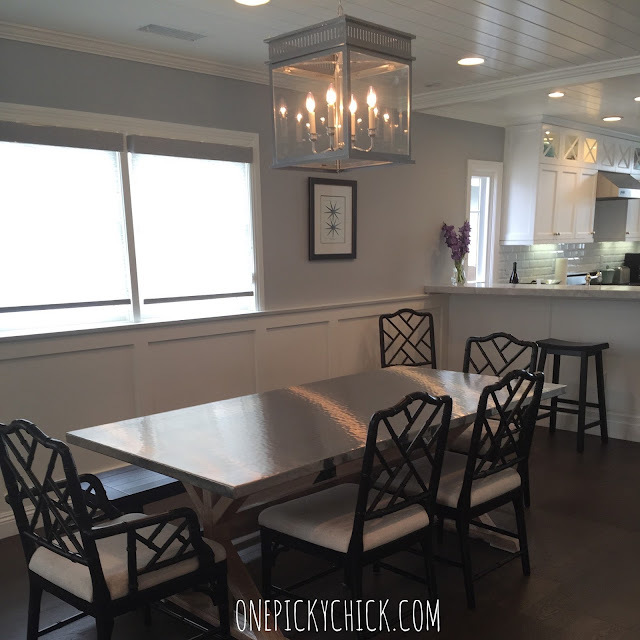 Just beyond the kitchen is the dining room with the board & batten paneling and lantern style light fixture. Followed by the formal living in the front of the house. Side note, I have no "before" pics but I will say this view is a big difference from what her house used to look like. The minute you step in the front door - there is a long, sweeping view of the house. Yet, within that space, there are 4 totally separate and defined rooms (even though there's no separating walls). It feels very open, especially for a house that is still just over 2,000 square feet. 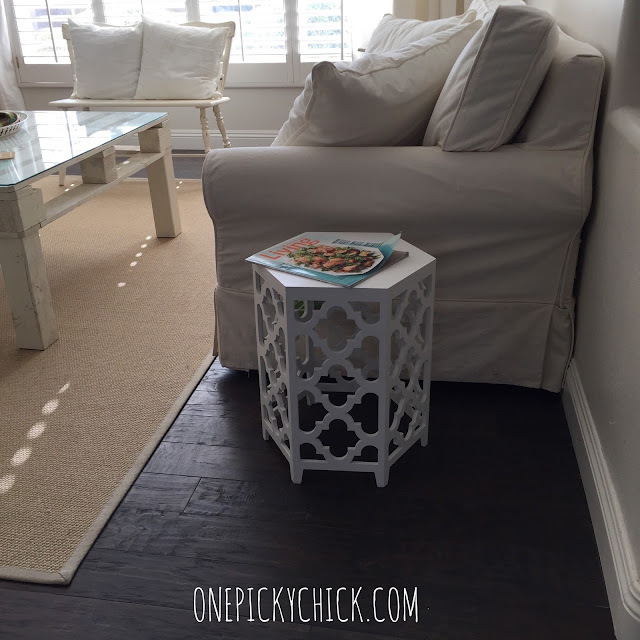 Her floors, by the way, are a very dark gray wood. It shows like a dark brown in the pictures but that's mis-leading. I might be afraid to do that but turns out it's a chance she took that really works. 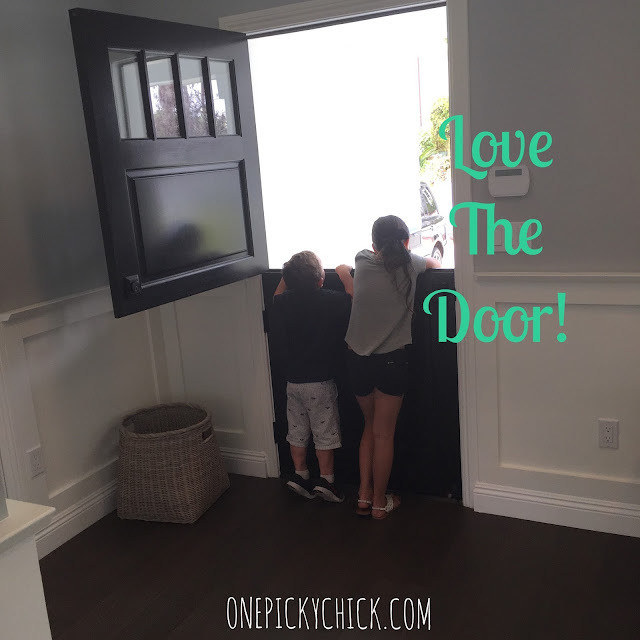 I also love that they kept the dutch style door the house previously had when they bought it over 10 years ago. My kids... loved it too! 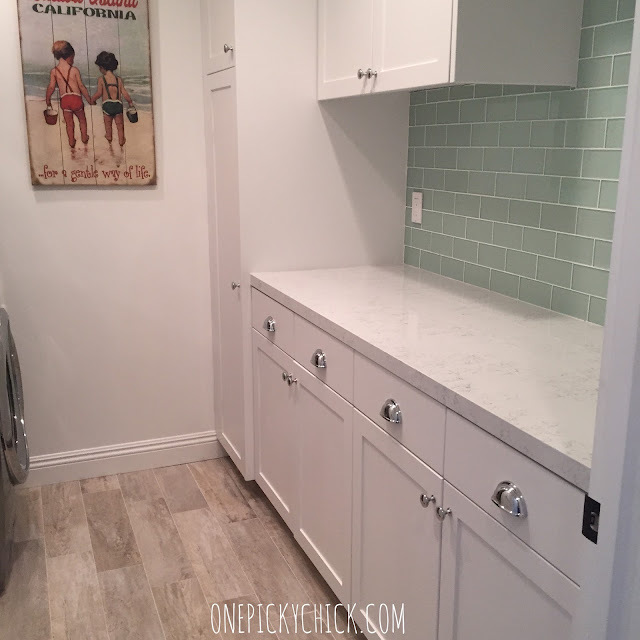 The laundry room is adorable and the light turquoise colored glass subway tile on the wall is the perfect addition to keep you in a good mood while you're working! 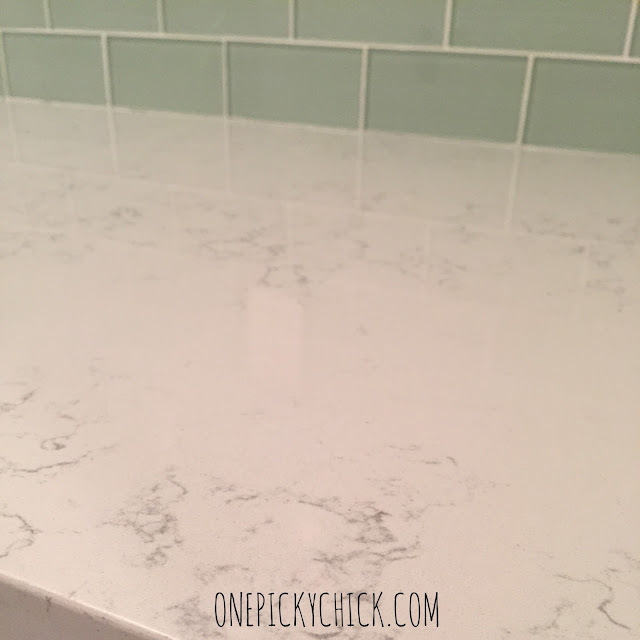 Also, the countertop isn't marble but a look-alike... it's a Quartz (brand Silestone, color "Lyra"). She also chose a porcelain tile wood floor look-alike in here and in the kid's bathroom (not very visible in the below picture). She wanted this bath to be fun, i.e. : the dark blue vanity... without being over-the-top crazy. Her kids are close to being "pre-teens" and the bath also doubles as the visitor restroom. 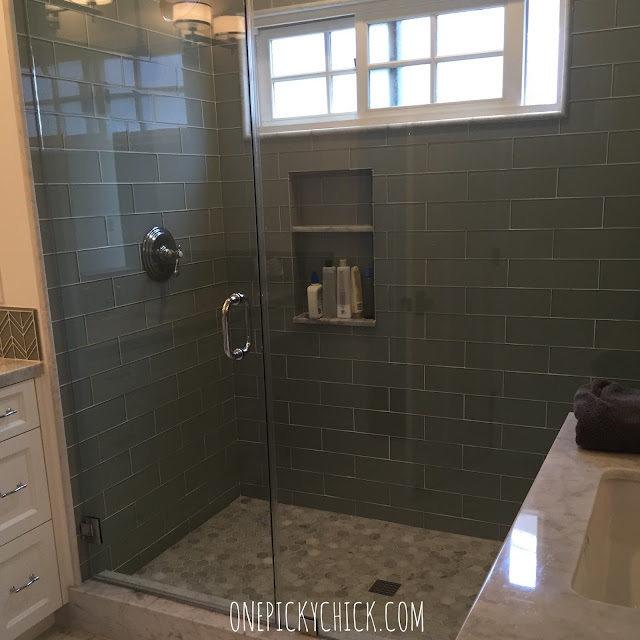 Still... she remained playful with her choice of an almost "mother of pearl" circular tile in the shower and backsplash! 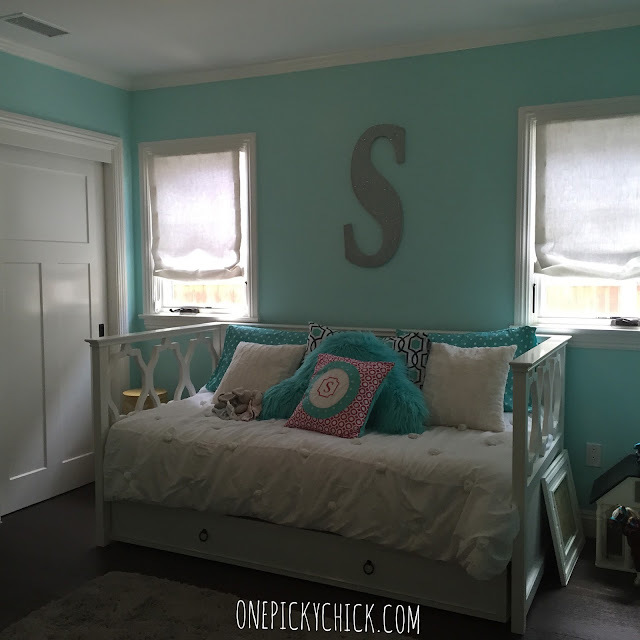 I love her son's room. Like, be still my heart love! 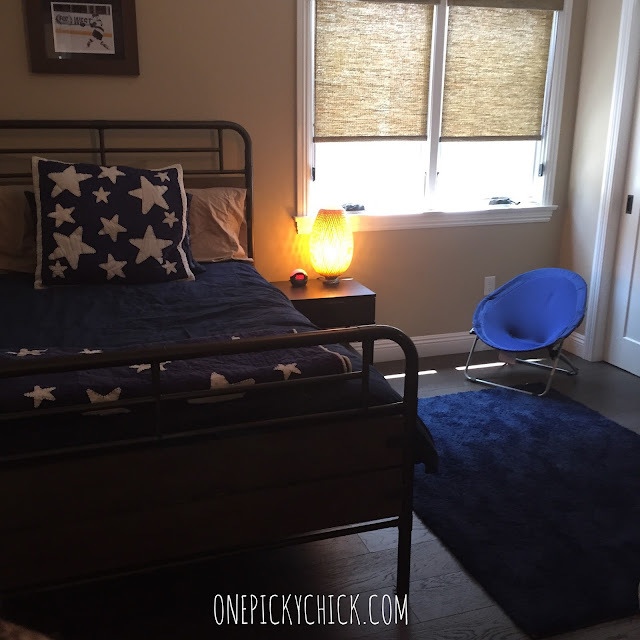 He's in 5th grade so it's a room that is no longer too "boyish" and can absolutely grow with him! 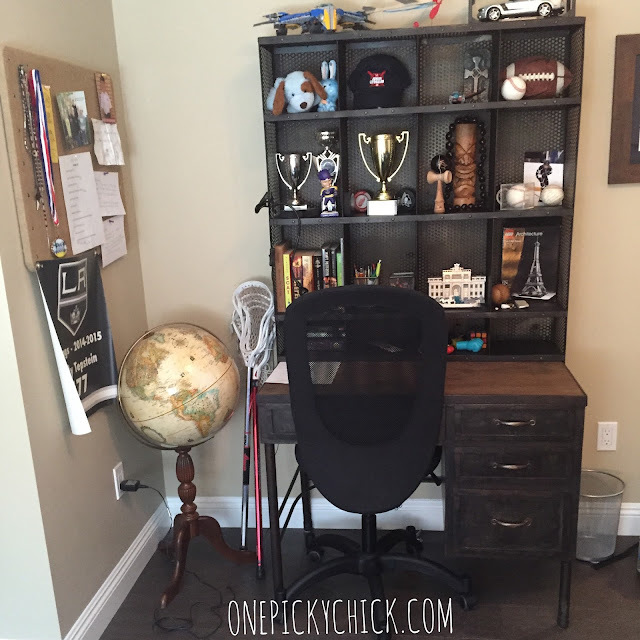 This awesome desk is from Restoration Hardware Kids. 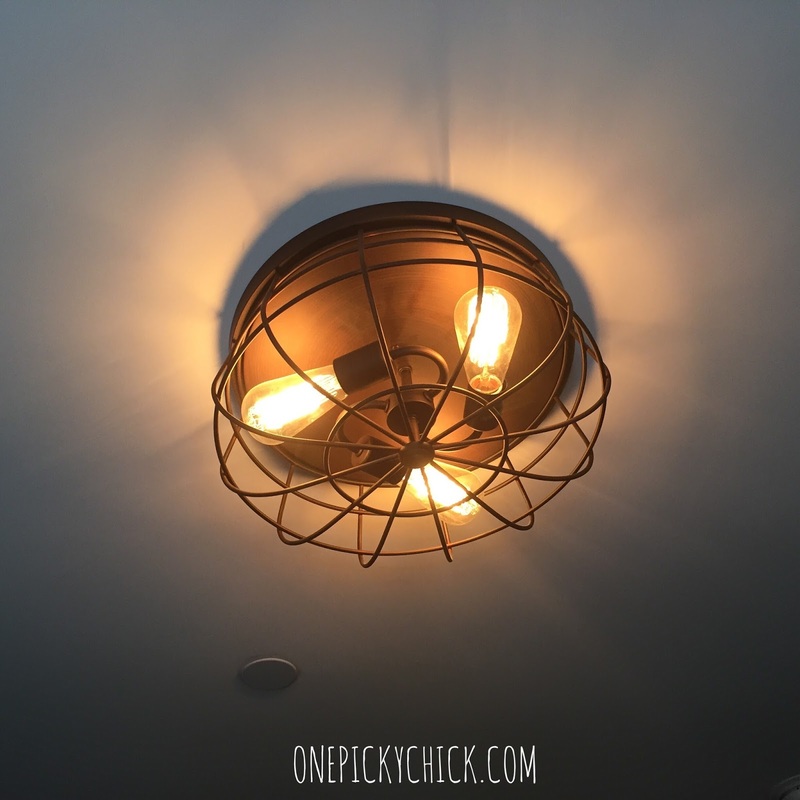 Plus, don't miss the cute ceiling light fixture! Her daughter's room, also in the 5th grade, is super sweet! Turquoise is definitely more "sophisticated" than pink. We'll probably go there at my house sometime in the near future too! You already saw a sneak peek of her bath... but this is her shower. She used an octagonal tile on her shower floor. Which, by the way, you can never go wrong with... completely classic and timeless. 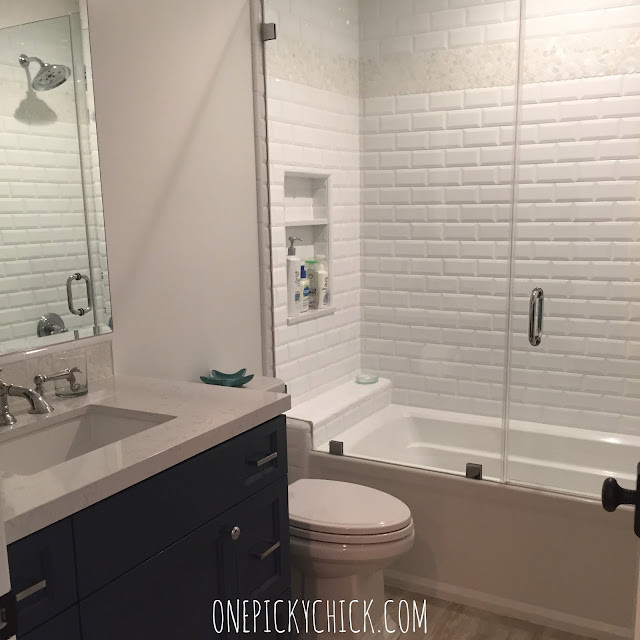 Plus a sea foam large glass subway tile on the walls. 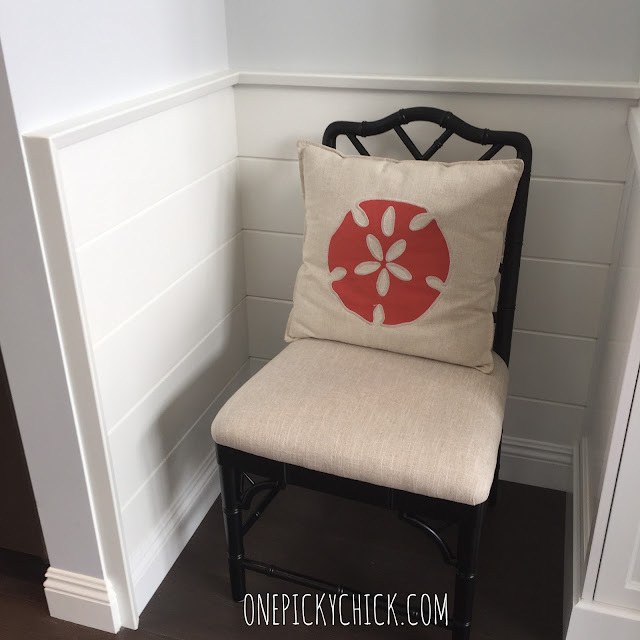 She added a bench... which is always a good decision in a large shower. They haven't organized it inside yet but the point is... they really don't have to! Those doors slide back parallel to the wall and you can't see them at all! Genius! The whole thing is a complete home run! I'm so proud of her accomplishments and she says, even after all the hard work, she's ready to do it again. Now that she knows what she's doing... I know, crazy, huh? Naaaaah... just having fun with homes! From One Picky Chick to another!